Lansing Cleaners is proud to be a Certified Wedding Gown Specialists™ through, the Association of Wedding Gown Specialists. We specialize in wedding gown cleaning, wedding gown preservation, and wedding gown restoration. Your family gown will be hand treated and cleaned (wedding, communion, christening, quinceañera) individually -- never in combination with any other bridal dresses or family gowns. We take every precaution to protect delicate beads, embroidery, and lace during the cleaning process. We clean gowns according to standard museum-quality practices, and you may arrange to inspect your bridal gown personally before it is carefully layered with acid-free tissue and folded into an acid-free, archival-quality wedding gown chest, preserving it for the next generation. When you choose Lansing Cleaners you'll have the peace of mind knowing that you can bring your gown back to us when it is to be worn again and we'll inspect and press the gown at no charge. While many stains are immediately evident, spills containing sugar, salt, and acid often initially dry clear and cannot be seen. These latent stains do not dissolve during ordinary dry cleaning and turn an ugly brown over time. Our unique anti-sugar stain treatment, featured in Modern Bride and Bride's, ensures that all sugar, salt, and acid -- seen or unseen -- is removed from your precious gown. We will gladly give you a free consultation and estimate for the care of any fabric, new or vintage, call or contact us today, 708-474-2459. If the wedding gown of your dreams is a family bridal gown that time has yellowed and stained, call us! We have members who specialize in restoring antique and vintage bridal gowns to the true color without damage to delicate fabrics or dyes. We can remove stains and discoloration that ordinary dry cleaners cannot. You can enjoy the wonderful feeling of using a family heirloom -- a family wedding gown or one of those special dresses you or someone in your family wore as a child. Call today for a free consultation because the perfect bridal or family gown for you may be the one in your attic! 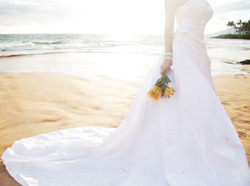 Since 2004, PreOwnedWeddingDresses.com has been connecting buyers and sellers of new and used designer wedding dresses. To improve a gown's resale value, we always recommend having it cleaned by an Association of Wedding Gown Specialists member like Lansing Cleaners."